This very colorful Macaw, the Camelot Macaw is a cross between a Catalina Macaw (hybrid cross between a Blue & Gold Macaw and a Scarlet Macaw) and a Scarlet Macaw. The Camelot Macaw has a lot of Scarlet Macaw in it from its parentage. The Scarlet Macaw, the best known South American parrot for over 100 years, is one of the most popular macaws frequently described as "beautiful and striking". The Camelot inherits all that beautiful coloring and more! Because hybrid macaws are a mixture of more than one type of macaw, the offspring are influenced by the traits and characteristics of both of its parents. Father's have the dominant gene, so this will generally influence the offspring's coloration and overall appearance. However the behavior and temperament are more unpredictable. The personality of a Scarlet is such that it requires good socialization and a firm consistent hand in training, especially as it matures. The Camelot can have these characteristics, but it can also have the gentle nature and the speaking ability of the Blue and Gold Macaw mixed in. It can be a very affectionate, inquisitive, and fun pet that is beautiful. The Camelot Macaw is a second generation hybrid macaw. It is a cross between a Catalina Macaw hybrid (Ara ararauna x Ara macao) and a Scarlet Macaw Ara macao. Camelot Macaws are among the most colorful of the Macaws. Their beautiful red coloration comes from the Scarlet Macaw portion of their parentage. 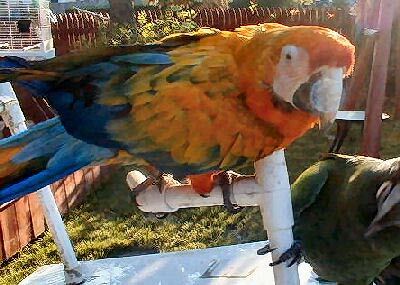 They are a full size Macaw and are highly intelligent and inquisitive. They can learn to talk with a general vocabulary of about 15 or more words or expressions. Hybrids are usually bred for color rather than personality, so their characteristics can be uncertain. A Camelot needs good socialization and a firm consistent hand in training, especially it matures. The Camelot Macaw is a full sized macaw, very close to the same size as its parentage. They will reach over 2 pounds. The length of the Scarlet Macaw is up to 85 cm (33.5 inches) and the Blue and Gold Macaw is up to 86 cm (34 inches), so the Camelot will be about the same. Dr. Jungle..."What an active lifestyle this pretty lady has! Here's what Lisa tells us..."
"April is an extremely shy bird! She has come out of her shell a lot in the 5 years I've had her. She is not snuggable, but she is not nasty either. She's just an extremely shy bird and doesn't want to be petted. She does like to stay on her playpen. The Camelot Macaw is a popular hybrid that has been successfully bred for many years. It is the most common second generation hybrid macaws seen today. Finding these beautiful macaws for sale is easier than some of the less commonly bred hybrids. I second the Camelots are NOT for beginners comment. Very intelligent. Have a sense of humor. Very bonded to their owner. Want to be on you or near you all the time. Get bored easily, need toys and stimulation. Mouthy/nippy/chewers - must train not to pinch you. Can be loud if unhappy or bored. Need lots of out of cage time & attention with you. If you can't devote at LEAST 2 hours a day or more interacting with them don't get one. Can easily become a one person bird if not trained to socialize. Also if you have a temper don't get one - they don't respond well to yelling. - need calm but firm corrections. Where can I find more photos of the Camelots birds? I am trying to improve a painting I did from an old photo. Hello, My name is noble, I am looking for a Camelot macaw. Please e mail me more details. Thank you. She bit my husband when he went to look.. all Macaws are different. I have a baby 3 months old, (handfed) Military who will not let me put her down.. her parents are very quiet, but she is a screamer if she cannot be held, or at feeding time, She sure lets me know.. I also raised and handfed a baby Scarlet Macaw.. she refuses to let anyone near me or my husband . She is a year old now and is trying to teach the other baby to "Step Up" .. I love Macaws. I have to watch her or she will pull the Military's feathers, and may try to hurt her.. when one is out, the other is up, my bedroom is a mess.. but I really don't care, because they love me so much. I have a camelot and she is a wonderful bird. Very affectionate, curious and intelligent. BUT these are NOT for beginners. Scarlets & their hybrids can be nippers. But they are actually are more sensitive than many other macaw species so they require an unusual combination of a firm hand but a lot a praise and gentle affectionate handling. This is a difficult mix for many people to keep in mind since they lose their tempers or get afraid when they get nipped by the bird. SO don't get one of these unless you understand what I am saying and think you can handle them properly.